Some reviews (both in the press and by folk I know) say that this is a brilliantly funny film. Others disagree. My wife says its the worst film she's ever sat through. I can see what they were trying to do. Much of it stands halfway between parody and homage. Then again, it is also halfway between comedy and action film, and that isn't a great place to be. Basically it is not funny enough to be a comedy and not action-y enough to be an action film. OK, there are amusing bits in it, but few actual laugh-out-loud moments (and they were all in the trailer), so it fails as a comedy. Mark Kermode has this rule of thumb about comedies - something is only funny if you actually laugh (not merely grin or smile) more than six times. I don't think I laughed that much. Yes, there were amusing situations, homages and lines of dialogue, but not enough actually funny. But if its not a comedy what is it? The action sequence at the end is way OTT and goes on for ages, but if you compare it to an actual action movie, then it is not that great. Similarly the 'whodunnit' aspect of the film, this is a pretty lamely plotted storyline which doesn't satisfy at all. So we're left with a film trying to be so many things and falling between all the stools. Shame. In true Kermodian fashion, Ricky, I respect the fact that you are free to express an opinion on all things filmic...but you're just plain wrong on this! 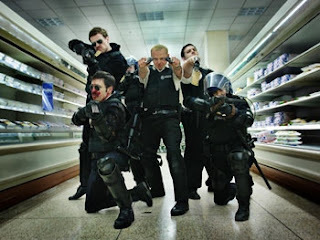 Hot Fuzz isn't as good as the near-flawless Shaun Of The Dead (what is? ), it is 20 too long....but I laughed, a lot....2nd and 3rd time through as well. So there. I still haven't seen Shaun of the Dead. But would this be a good time to point out that I never really appreciated 'Spaced' much either? I can't deny that I was amused at a number of bits of the film. Maybe if I'd watched it with a group of blokes I'd have got into the spirit of the thing a bit more, but I still think the film was seriously flawed. It tried to be more than a comedy and ended up being less funny than it should have been as a result. I've never seen Spaced; and I haven't watched it with blokes either....unless you count my wife (in the cinema, first time), and my wife and my dog (at home 2nd & 3rd times) as blokes.